Cardinal Dolan addresses congregants at the historic St. Peter’s Church in lower Manhattan during the Vigil Mass he celebrated Sept. 8. To the cardinal’s right, in green chasuble, is Father Jarlath Quinn, pastor of St. Peter and Our Lady of the Rosary parish, who was a concelebrant. The cardinal blesses a sculpture of St. Florian, patron saint of firefighters and EMS workers. It is one of four bronze statues that grace the top of the steps outside the church and part of a 9/11 Catholic Memorial there. St. Peter’s Church on Barclay Street “isn’t just about the past, it’s about the present and it’s about a future,” Cardinal Dolan said at the Vigil Mass he celebrated there Sept. 8, the Nativity of the Blessed Virgin Mary. “You are a living, vibrant, hopeful, welcoming church and parish, and I congratulate you for that,” he told the faithful of St. Peter and Our Lady of the Rosary parish, and their pastor, Father Jarlath Quinn. Before the Mass, the cardinal also blessed four bronze statues, relocated during the summer to the top of the church steps of St. Peter’s, from St. Joseph’s Chapel in Battery Park City, which closed in January. The statues honor all who perished on 9/11 and those who took part in the rescue and recovery effort. The outdoor statues are part of the parish’s 9/11 Catholic Memorial. Also relocated to the St. Peter’s Church from St. Joseph’s Chapel were indoor statues and artifacts. St. Peter’s, at 22 Barclay St., was established in 1785 on the site it now occupies and carries the distinction of reportedly being the first Roman Catholic parish in New York state. It is located near the 9/11 Memorial. Additionally, he acknowledged after 9/11, “the number of people who came here not only for the solace and prayer and comfort,” but also “for a first aid station and, sadly, a mortuary.” It was also where the body of Father Mychal Judge, O.F.M., an FDNY chaplain, was brought after he died in the line of duty at the World Trade Center. The processional cross located inside the church has a steel cross from the 9/11 site embedded in the back. “What a great home of worship, what a great Catholic place of worship this has been, welcoming so many venerable people,” the cardinal said. “I thank you for being a good shepherd,” Father,” he said to Father Quinn. After Mass, a reception showcasing the colorful, contemporary catechetical center, where classes have been held for the past year-and-a-half, was held. The parish center, which serves as a multi-purpose space, was completed in December 2016. Among the families there were Andrew and Erin McElduff, and their 10-week-old son Gannon. The baby, who will be baptized Sept. 30, attended his first Mass Sept. 8. “Your son’s first Mass with the cardinal is pretty special,” added Andrew McElduff, 34. Father Quinn, he said, is a welcoming pastor at the “family-oriented” parish. Maiwenn Jaffres, parish manager and coordinator of religious education, said, “If we don’t have this down here, we have nobody up there,” she noted of the catechetical center, located below the church. Luke Conboy, 8, an incoming third-grader, said he finds it to fun to learn about Jesus in the religious education program and enjoys sharing the time with his friends there. Highlights include making his First Holy Communion last year, learning about the Stations of the Cross and values such as the importance of treating others nicely. • St. Michael the Archangel, patron saint of police officers, in remembrance of the NYPD and PANY/NJ police offers, and those who participated in the rescue and recovery effort. 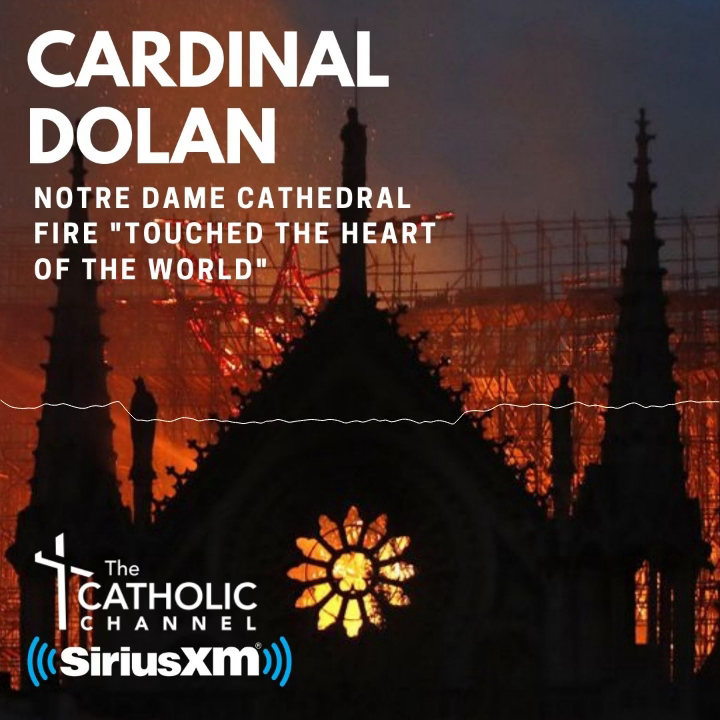 • St. Florian, patron saint of firefighters and EMS workers, in remembrance of the FDNY firefighters and EMS workers, and those who took part in the rescue and recovery effort. • St. Mary Magdalene, first witness to the resurrection, in remembrance of those who perished in the airplanes that crashed into the two towers of the World Trade Center: the passengers and pilots and flight attendants, and the volunteers who came to serve at Ground Zero afterward. • St. Joseph, patron saint of workers, in remembrance of those working in the World Trade Center and the construction workers who took part in the recovery and rebuilding effort.